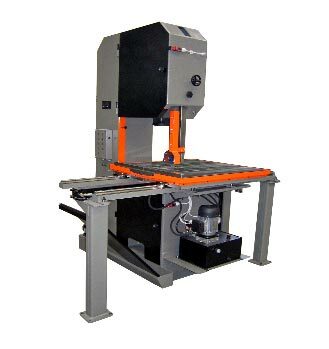 COBRA Plate - moving vertical bandsaw design allows easy loading and unloading for the material. After securing material in place, the bed plate moves with material smoothly into cutting area. The design is ideal for cutting block, plate, or mold steel.Blade changing is easy and convenient. Convenient and Safe material on/off loading. Hydraulic control enables fast and easy Guide Arm positioning. Infinitely variable feed rate and blade speed control. Hydraulically activated tungsten carbide inserts guide blade to achieve straight cuts and long life. Easy-to-operate control console is conveniently located with full view of cutting work. Hydraulic chip auger located directly underneath cutting area conveys metal chips out into collection bin. Blade monitoring control with automatic blade breakage sensor and blade speed display. Powered wire brush effectively cleans blade for longer blade life and improves cutting performance. (1) Due to continous improvement , specifications & designs are subject to change without prior notice. (2) Optional accessories shown in machine photographs are at extra cost.